Don't mess with me. I may look like hell, but I'm a real samurai! 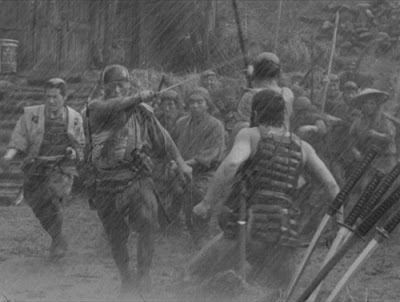 (SPOILERS) Hugely influential classics such as Seven Samurai are so well covered and thoroughly examined, there’s scarcely anything left to say about them. That being the case, I may as well begin with a negative: those influenced, including those remaking the film in inevitably inferior fashion, have been well-advised not to imitate its running time. 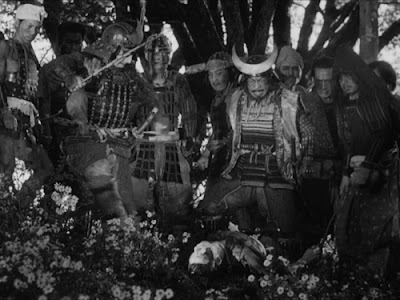 Really, good as the picture is, Akira Kurosawa had no business making it three and a half hours long. It isn’t that it drags horribly (it doesn’t), but it’s so studiously unhurried that the indulgences are extra-obvious, and, while I would never condone cutting a movie against its maker’s wishes, I can quite understand why the scissors were pulled out in this case. Nevertheless, it’s quite easy to see why this was the director’s favourite of his films, and why it remains his most popularly acclaimed (all those votes on IMDB can’t be wrong; don’t tread the message boards if you too think it’s a little on the extended side, though – although, the inadvisability of posting comments probably applies to any movie there, unless you’re a masochist). On the positive side, the luxurious running time affords us ample time to get to know not only each of the seven, albeit some better than others (none are mere faces, though), but also insights into the attitudes of the villagers they vowed to protect; often petty-minded and vindictive, they are borne into a caste system they have no option but to endure (in a particularly chilling scene, an elderly village woman forks a captured bandit to death in vengeance for the murder of her son). Notably, the bandits are almost entirely indistinct, save for the sensible decision at the outset to save their plundering until post-harvest. 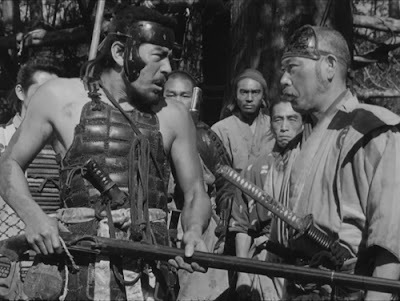 As such, the picture could perhaps have more clearly established that the distinctions (or lack thereof) the villages make between bandits and samurai are partly based on the two intertwining (that many a disenfranchised ronin would turn to banditry to support himself), even given Kikuchiyo’s memorable outburst concerning samurai leaving him an orphan. 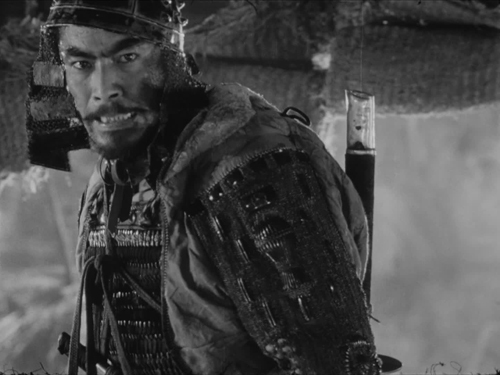 The most indelible of the seven is, of course, Kikuchiyo, thanks to Tohsiro Mifune’s gusto-driven performance as the wannabe samurai who repeatedly proves how at odds with the reserve and discipline of the warrior (Kikuchiyo is out of his gourd early on, and in an amusing introductory scene is unsuspectingly bashed on the head by Katsushiro; all the other candidates have been wise to his hiding in wait far in advance). Mifune said it was his favourite role, and it’s certainly a tour de force of unbridle energy, almost exhaustingly so. It’s also interesting, given how influential this is, that the loudmouthed braggart who ends up as the most identifiably heroic character (if not the soundest of judgment) has been diluted in later incarnations. The latest would be Chris Pratt in The Magnificent Seven remake, but there’s never any doubt about his skillset. 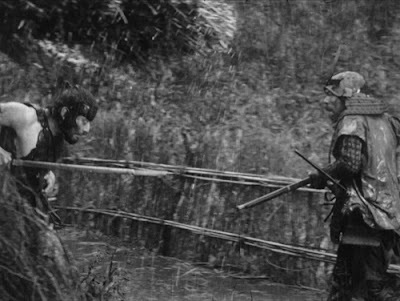 It’s Kickuchiyo who ploughs on after being shot, running the chief bandit through, but early on we keep expecting the character to be run off, or proved a coward; at very least, to continue as a permanent joke ("You're so special, I represented you by a triangle" he is told of a banner in which the samurai are signified by circles). Hollywood isn’t generally inclined to go quite so far off the straight and narrow, even when in full blown anti-hero mode. 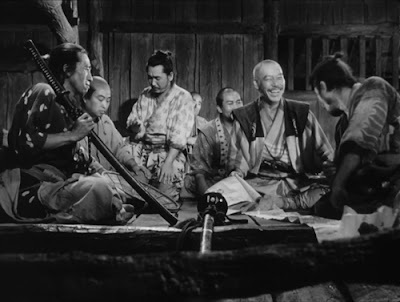 Other highlight performances include Takshi Shimura’s leader Kambei, shining with moral rectitude and wisdom, but also a quiet sense of humour (also amusing is how diligently he marks off the progressive body count on his chart), and Seiji Miyaguchi’s ultra-serious-minded Kyuzo, who allows himself a rare smile, when no one else is looking, after the permanently bedazzled Katsushiro has effusively praised his amazing skills again (“You really are great, Kyuzo”). Then there’s Kato Daisuke’s perma-smiley Shichiroji. 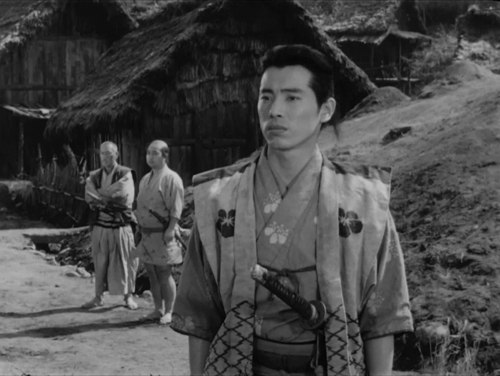 Isao Kimuro also makes an impression as Katsushiro, although that may be because he’s given the most screen time, even more than Mifune; his tentative romance does rather go on. It’s an inoffensive plotline, what with his frolicking amongst the flowers with Shino (Keiko Tsushima), but begins to feel repetitive when her father (Kamatari Fujiwara) starts wailing on at her the for the umpteenth time. 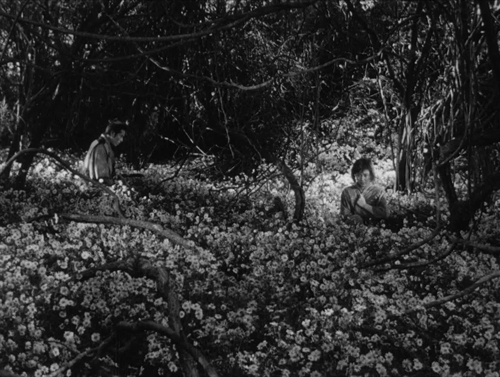 A lot of that is down to Fujiwara’s one note, extreme-pitched performance, though. The coda, in which Shino rejects Katushiro to celebrate planting crops with her fellow villagers, emphasises the lonely lives the samurai lead (albeit reinforcing their nobility) and that, as Kambei notes, “The victory belongs to the farmers, not us”. The bandits rock up with about an hour to go, which gives some idea of the extended running time, and Kurosawa’s rain-drenched action remains highly impressive. Earlier, we’ve witnessed a masterful first taste of his skilled staging when Kambei takes down a thief who erupts from a hut in slow motion (Roger Ebert has suggested this sequence is the basis for the hero being introduced in a signature, self-contained subplot, such as Dirty Harry, and that’s easy to go with), but the sustained carnage is something else. It’s notable too how much the combined martialling of the villagers contributes to the victory; while this element has remained in later versions, the focus has been appreciably more on the role of the seven. 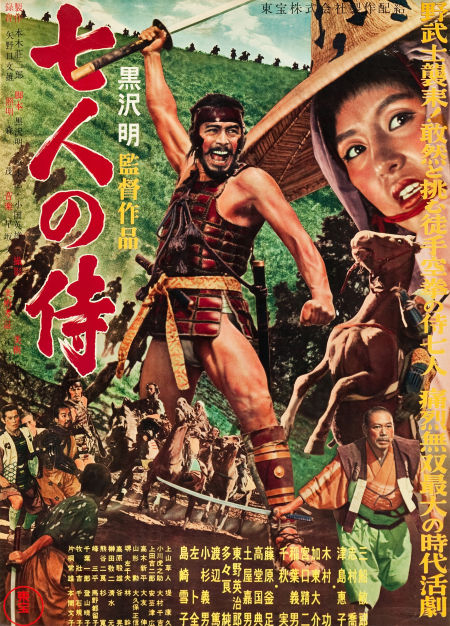 Admittedly, I’m not hugely au fait with Kurosawa’s oeuvre, a scandalous omission I keep itending to remedy, but it’s immediately obvious that George Lucas’ indebtedness in respect of Star Wars (notably co-opting C-3PO and R2-D2’s roles from the peasants in The Hidden Fortress) extends to Seven Samurai, which he has also cited as his favourite film. Name the protocol droid does this weary reflection, by a Seven Samurai villager, sounds like: “We were born to suffer. It’s our fate”?